The Flower House is a no brainer. Planning a wedding without a professional planner can be stressful but there was a giant part I knew I didn't have to worry about-- the flowers. I had 2 meetings with Jinger, the first one we went over basics of what I like and don't like, flower color, and types of flowers. The second meeting I showed her pictures of my dress, bridesmaids dresses, and we talked specifics. That was it! It was painless and I had complete trust that she would do a wonderful job. It was executed perfectly. The day of, Jinger came by my dressing room to say congratulations and they did all kinds of special touches with the lavender that I didn't even think of. The altar looked stunning, and I even kept the flowers from my sweetheart table for a week after. She responded quickly, her pricing was excellent, and she answered all of my questions with ease. I felt so comfortable the entire process. Thank you so much to The Flower House. It was a real treat having you a part of my special day. Jinger and her team were fabulous! Jinger is an expert in what she does and helps bring your vision to life. I appreciated her guidance, support and professionalism throughout the whole wedding planning process. I would recommend friends and family to work with The Flower House. My husband and I are so happy they were part of our special day! Oh my....thank you so much. it was such a pleasure working with you two!!!! The photos look amazing!!!!!! Happy New Year!! I cannot say enough good things about Jinger and her team at The Flower House. The day of my wedding my bridesmaids went into the dressing room first, called me over and said, "You need to see your bouquet, it is stunning" and they were right! The flowers that she did for me were so gorgeous. I got so many compliments throughout the night and after the wedding on how amazing the flowers were. When we met with Jinger, I wasn't too sure on what I wanted. She showed us a ton of photos, went through a lot of different options, and I felt like she was really able to nail down our wedding "vision" and knew exactly what I wanted, even if I didn't. After our appointment my husband said that we had to book her because he was so impressed by her organization, creativity, and skill. I appreciated that she gave us her honest opinion on what would look best in our reception and ceremony space. Her help was so key in our planning. I have already had two engaged friends ask me who my florist was so they can reach out to her for their own weddings. Thank you so much Jinger!! Jinger and her team are phenomenal. I highly recommend The Flower House to any couple! 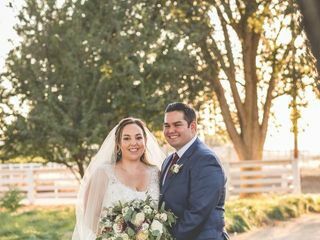 We planned our wedding from the east coast and when we asked our venue (Wente) for their personal recommendations for florists, without hesitation they responded “Jinger!” Other couples have also been lucky enough to be referred to The Flower House and the praise is so deserved. From the moment we spoke with Jinger, we recognized how knowledgeable and passionate she is. We had ideas of what we liked but Jinger guided us to pull the details together in a cohesive manner. When we met in person at her office, she was patient, dedicated and warm. She provided honest and spot-on advice for rentals (linens, chairs, lighting) and she listened carefully before showing us various floral options. In our correspondence leading up to our wedding day, Jinger was responsive and thorough, and this was incredibly helpful since I was finalizing details from the opposite coast. Her dedication and love of design truly shone through on our big day. When I first saw the florals, they took my breath away; our guests repeatedly complimented how beautiful they were. THANK YOU for making our wedding day absolutely stunning! 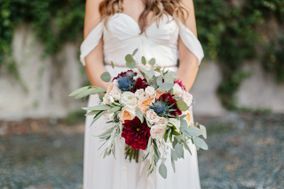 I discovered Jinger and the Flower House when my coworker hired her for her own wedding - she said Jinger had also done her sister's wedding and her bouquet had been the prettiest she'd ever seen. The day I was supposed to meet with Jinger, my grandfather passed away and my coworker accompanied me to our appointment instead of my mom. I was a little overwhelmed and have never been well versed in flowers - I basically knew the colors I liked and general feel I was going for, but was not much help. Jinger knew my venue and what would work, listened closely and pulled up example pictures for me to comment on. She even had amazing suggestions for the linens and uplighting. Jinger somehow spun my few ideas into a beautiful, cohesive whole, and was so responsive to my emails during the planning process. I gasped when I got to our venue and saw all of the arrangements, and guests told me our flowers were the most beautiful they'd ever seen. My bridal bouquet is currently sitting on my dining room table and I can't stop smelling it. Thank you Jinger for everything you and your team did - it was beyond perfect. Made our wedding vision come true! Jinger was so wonderful to work with for our wedding last October and truly helped make our wedding vision come true! She was extremely professional, knowledgeable, and thoughtful in every interaction we had with her, from our initial consultation up to the day before our wedding and even with a follow-up after to ensure that every detail was exactly how we wanted it. We received so many compliments on her floral arrangements for both our ceremony and reception! Her team also went above and beyond to move the large floral arrangements that we used for the ceremony to a separate room for our reception (up two flights of stairs!) so that we could include them for the remainder of the night. 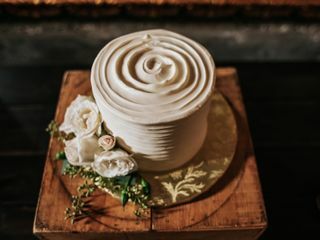 All the floral arrangements and details that she provided - from the bride/bridesmaids' bouquets, to the stunning centerpieces, to the flowers for our cake - brought such a natural and romantic feel to our wedding that was everything we had imagined and more. Thank you so much, Jinger, and we wish you and your team all the best!!! I would do 10 stars if I could! I first met Ginger from Flower House at a wedding fair, and based on what I saw there, I knew I wanted to hire her for my wedding day. She is so incredible talented. She is also patient, responsive, and easy to work with. She gave suggestions when I asked, but really wanted the vision to me mine. I got so many compliments on my flowers! The wedding bouquets were stunning, and the centerpieces were impeccable. If I ever need flowers for another event, I will hire Flower House. Highly recommended! 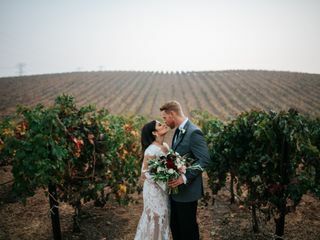 My husband and I recently got married at Wente in Livermore. They had a preferred vendor list and at the very top was The Flower House. After looking through their website and Instagram, I knew I needed to meet with Jinger and see if we would be a good fit. She BLEW MY MIND!!!!! She was so knowledgable about her product as well as the venue, it was incredibly helpful. I was planning the wedding from AZ, so I could not meet with her often, but we emailed quite often. Jinger was always willing to adjust and help my vision come true. As the wedding day arrived, Jinger brought the venue to life! Her designs made a world a difference and I was getting so many comments about how lovely the flowers were. If you are wanting a team full of knowledge, energy, and empathy then choose The Flower House! Jinger and her team at The Flower House did a fantastic job with all of our flowers for our wedding in June 2018. She was extremely organized, responsive, and professional. 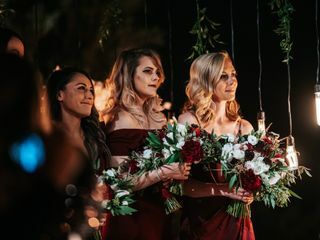 We didn't have a distinct idea of what particular types of flowers or style of flower arrangements we wanted, but luckily Jinger helped us to discover what we liked during our initial consultation. Overall, we felt that she really listened well and truly captured our vision in terms of color, style, and arrangement of our flowers. We would happily recommend her to future couples looking for a great florist with many years of experience. Jinger was AMAZING!!!! The Flower House exceeded all my expectations. From the start, Jinger knew exactly my vision and what I wanted/what I didn't. She met with my mom and I whenever we needed, and offered her professional advice but was able to keep what I wanted as priority throughout the whole process. The Flowers for our wedding were STUNNING! The candles, flowers, all the details were perfect! I couldn't of been any happier with how it all turned out! Thank you so much Flower House! Thank you so much! You validated why I love what I do - Blessings! Thank you for allowing us to be a part of something so special. I can't say enough how much we loved working with Jinger!!! She not only helped my vision come to life but made wonderful suggestions and guided me each step of the way. She also was very respectful to our budget and found creative ways to keep us there while giving us BEAUTIFUL flowers!! She also gave me suggestions on the overall decor and colors. Can't say it enough....absolutely wonderful! If you aren't working with Jinger you are missing out. Jinger's work blew us away!! Our centerpieces/bouquets/etc. Were so gorgeous! 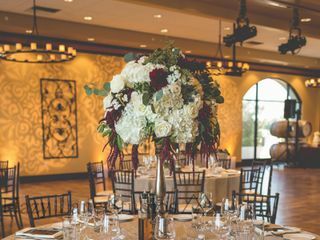 We had her for our wedding on November 11, 2017, Our guests loved her work and were amazed by how beautiful our floral and centerpieces were! She was also mindful of our budget, and gave us options to fit our budget. Jinger is really great at what she does! Her work is lovely and mind blowing, and I highly recommend her! We absolutely loved the flowers Jinger designed for our wedding. She was able to take our ideas and create arrangements with just the look we wanted. Flower House surpassed our expectations! The flowers were incredible, beyond my expectations! Jinger was really able to understand the look we were going for at our wedding and expand upon it! Our meeting with her was incredibly helpful as she provided photos of what we were looking for and modified as we went along. She even had suggestions about what kind of tablecloths and vases would work best with the flowers, so helpful. I was very comfortable that she would provide the look we were going for - and I was blown away! Even as I changed my mind (multiple) times Jinger and her team were accommodating and understanding. I absolutely loved the bridal bouquet and Chuppah flowers - they were magnificent. I strongly recommend The Flower House to any brides who are still searching for a florist - they will not disappoint! Jinger and her staff made our wedding day dreams come true! When we first met with Jinger we were in the early stages of planning and needed some direction. Jinger listened to our ideas, got to know us and our personalities and from that she was able to help us create the best floral arrangements ever! We knew we wanted a rustic look, nothing too formal or too wild! With the color scheme we gave her she was able to create just what we had envisioned! Throughout the planning process Jinger was very responsive to our questions. We knew we were in good hands! The day of the wedding Jinger came out and spent time making sure everything looked as discussed! Also she is very honest and worked with our budget! That was a huge plus :) Jinger took her time to hand deliver the bouquets and boutonnières. We are so happy with how everything came out! Fabulous. Sarah loved and trusted Jinger from the start. The flowers at her wedding at Silverado Resort in Napa were incredible. 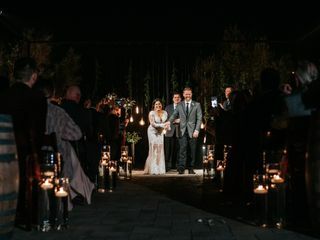 From the baby carriage, to the ceremony pieces, to the reception flowers and the bridal party flowers....all more stunning than we could have dreamed. Don't hesitate. Run to FLOWER HOUSE. The arbor and hanging vases too! Thank you so much! We loved being a part of your big day! Congratulations! Cheers! Words cannot describe how wonderful it was to work with The Flower House. I am a very particular bride and Jinger made sure everything was perfect. She really took the time to understand my vision and make it come to life. I never had any doubts but she really blew my mind. I wouldn't go anywhere else for flowers. You are too sweet! Thank you for your trust and confidence! So thrilled we rocked it! I really want to say Thank you to The Flower House. Jinger and her team really made my dream come true!!!! All flowers and decorations are amazing and wonderful. I was surprised when Jinger delivered my bouquet to my bridal suite. How beautiful it is!!!! It's what I exactly want and I love it so much! Jinger is a genius when it comes to flowers. I have no eye for flowers, themes, or vision on how to put different decorations together, and I can honestly tell you she nailed the flowers. They were beautiful. I had a budget and she helped me stay in the budget. Everything was amazing. Her work really brought my wedding together. When she told me to trust her, I was a little hesitant. However, I'm so glad I did. Book her far in advance as she books up fast! And there's a reason why! You can't go wrong! Thank you so much for these kind words - I am blessed that I was able to help pull it together for you. Congratulations. The team at the Flower House really went above and beyond for my wedding, they blew me away! From the initial meeting with Jinger, I knew right away she was going to create something beautiful. She genuinely listened to vision and kept in touch through out the process. We received so many compliments from the guests on our bouquets and decor from the Flower House. I would absolutely recommend The Flower House to anyone looking for a professional, insightful and personable florist for their event! Thank you so much! I am thrilled to hear from you! We are so glad that you loved everything. Cheers!! If I could, I would give Jinger and the Flower House team 10+ stars. If you are looking for a florist for your wedding, stop looking and book the Flower House. Jinger and her team were incredible and so easy to work with and they helped make our dream wedding become a reality. Jinger was available throughout the entire wedding planning process to answer any questions we had, and she helped us create this gorgeous vision for our big day. Hands down the most amazing team to work with for any wedding or event. I couldn't ask for a better florist team. I loved working with The Flower House for our wedding flowers! Jinger was so wonderful to work with. She was flexible and worked within our budget. The flowers were perfect and match the vision for our wedding exactly as we had hoped for. We owe The Flower House a huge thank you for their beautiful work on our wedding. Jinger and her team were incredibly accommodating to our planning from Seattle. Jinger made herself available to speak with us over the phone at convenient times, not to mention answered all questions via email promptly. She asked questions that pushed me to think about not just the flowers, but how all components of the wedding (lighting, table cloths, decorations) play off one another to create a cohesive space. And I really appreciate how she shared information with me: when we met in person, she asked questions about what I wanted and then showed me a series of photos to ensure we were on the same page. And then there’s the actual wedding day: everything was beautiful! The flowers were just breathtaking and showcased the talent and skill of Jinger and the Flower House team. Thank you so, so much!!! Wow Cat! Thank you so much! I am so thrilled you loved everything - We are excited to see photos when you can share! Cheers! I absolutely love the work from the Flower House. Planning our wedding from a different city was definitely difficult and it was hard for us to meet with vendors. I had a lot of back at forth with Jinger and gave her so many different ideas. In the end, she was able to recreate my pinterest inspirations and it was beyond my expectations! I went to her simply thru the work I saw of hers on her website and instagram and I instantly fell in love with it! I wish the flowers lasted a lot longer so that I can keep the beauty of it! They were all very helpful and responsive and their quality of service is AMAZING! We found The Flower House through our venue and we are so happy we chose them to do our flowers! We first went and had a consultation appointment with Jinger where she would show us a series of photos and we would pick which ones we liked and disliked and from there she put together what she thought we were looking for as our flower vision. It was a really neat way to figure out what it is what we wanted. She was willing to work with us to get us down to a the price we were comfortable with by cutting a little here and there and making the cost within our budget. On the day of the wedding I was blown away when the bouquets were delivered to the Bridal Suite. The flowers were amazingly beautiful and I was so thrilled! 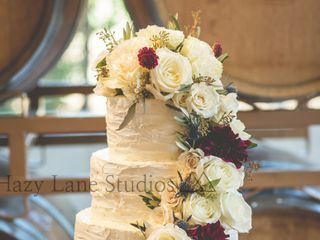 The ceremony had flowers along the aisle and two large centerpieces on wine barrels at the alter and it was PERFECT! For our reception we chose a mixture of a high and low centerpieces and it looked amazing. Jinger and The Flower House exceeded what we had expected and we are so happy we went with them for our wedding day! I really appreciate the beautiful words! Thank you so much!